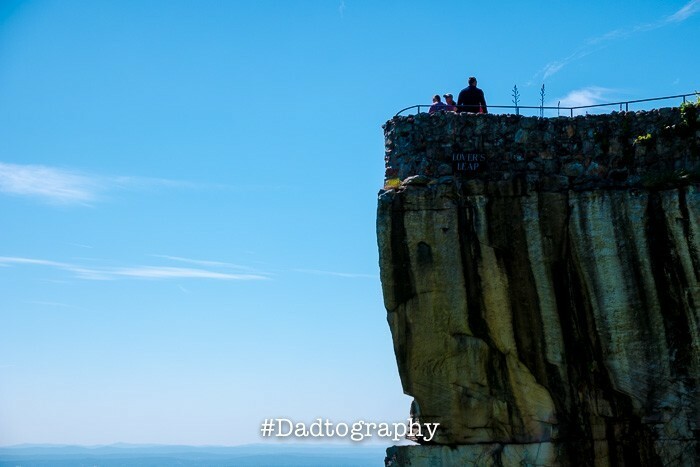 Dadtography is road-trippin’ again, this time we make a stop at Rock City, TN. I’m sure you’ve seen the now-famous billboards on the Interstates at some point in your life. “See Rock City” billboards have been a fixture on the nation’s Interstates for decades, and I finally made time to stop and see the famous icon. Below are my thoughts on my visit to Rock City, just outside Chattanooga, TN. Rock City Gardens is a popular attraction found just outside Chattanooga, TN, north of Atlanta, GA. I’ve done dozens of road trips up and down I-75 and passed Rock City every single time, but I’ve never actually made a stop. That just had to change. So, I decided to pay Rock City a visit with the intention of taking as many photos as I possibly could. I won’t share the story of the Gardens; I think the Rock City website does a fine job of that, here. What I will share is that I was pleasantly surprised, shocked and in awe during my visit to this classic stop. Is Rock City worth the price of admission? General admission for adults is $19.95 and is $12.95 for children up to 12 years old. Being an Orlando resident, $20 is pretty inexpensive considering the theme parks in this town continue to raise their admission prices. Don’t get me wrong, Rock City and Disney World are not even in the same realm, but what they are is they’re venues that provide entertainment for a price. I found the experience of Rock City to be worth the $20 I spent to get in. If you can find better deals on admission, I say take advantage, because the views provided alone are worth the price of admission! So let’s break it down. What were the best and worst parts of Rock City? That’s why you come to Rock City, right? That’s why I went. I brought my NX1, a freshly charged battery and an empty memory card and I went nuts (see below). Rock City is a great spot for photography, from the trails and paths, to flowers, birds, bridges and gaps – there’s just so much to shoot in one place! No attraction is perfect, right? Rock City is great for the money, but I just have two words: the gnomes. Rock City Gardens has somewhat of a natural walk-through flow to it. You come in and walk past a waterfall, down a path and through some tight spaces. Those parts are all fun! You get to see Lover’s Leap, you can stop at the cafe for some refreshments and sit a spell in one of their rocking chairs. Very nice! But then…you get to the gnome portion of the gardens or Fairyland Caverns, as it’s known. The caverns themselves are pretty cool. What’s not cool are the gnomes staring back at you or the nightmare-inducing scenes depicted throughout the caverns. I’m not taking it too seriously, but I could have done without caverns full of gnomes. I guess I’m a cavern purist.